Jack's has the Briggs and Stratton Repair Kits you need to fix your pressure washer pump. We carry a wide selection of repair kits including check valve kits, head rings, injector kits, piston kits, pump repair kits, unloader kits and much more. 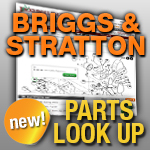 Check out our selection of Briggs and Stratton Pump Repair Kits below!